Education Loan Task Force (ELTF) is one of the three initiatives of this eMagazine PreSense. Education Loan Task Force (ELTF) was started in 2010 as a social initiative, to create awareness about the Education Loan Scheme of the Indian Banks Association (IBA). ELTF takes up the common grievances with the managements of banks, IBA, the Government of India and also the Parliament. ELTF receives daily feedback through its website, www.eltf.in. ELTF has so far provided clarifications to more than 18,000 students/parents. Around 3,000 grievances have been forwarded to the managements of banks for investigation and settlement. ELTF strongly feels that Education Loan should not be treated as yet another commercial loan. It is an investment on the youth of this country for nation building. This category needs to be treated differently from the other loan segments. This ezine PreSense and ELTF organised an ‘Interactive Session’ with Shri Arjun Ram Meghwal, Hon’ble Union Minister of State (Finance & Corporate Affairs) with bankers, students, parents and social workers on Friday, 17th February 2017 at Chennai. Senior level Executives from 40 banks participated, besides several NGOs, parents, students and the media. Susan Koshy, Editor welcomed the gathering and explained the various social initiatives of the ezine PreSense. K. Srinivasan, Editor in Chief, PreSense presented the various issues and challenges faced by students and parents right from the application stage to the repayment stage of Education Loan. 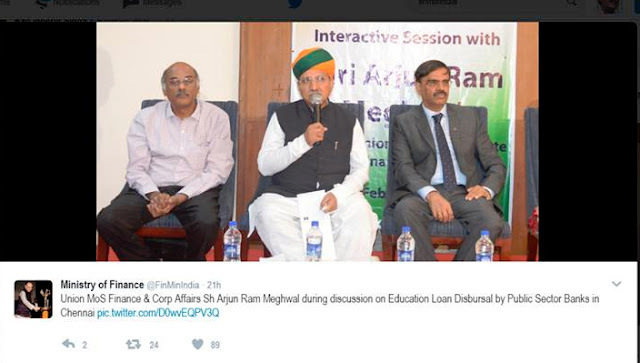 Shri Arjun Ram Meghwal interacted with some of the participating parents and bankers to understand the difficulties. In his reply address, he promised to discuss all the problems with the government officials at New Delhi and find a solution. He also promised that he would involve ELTF in those discussions. Shri Arjun Ram Meghwal, after listening to all the grievances from various participants, assured that the Government would immediately advise all the Banks to nominate a Nodal Officer at all Regional / Zonal Offices and a Grievances Cell at Head Offices exclusively to resolve Education Loan grievances. During this event, PreSense and ELTF honoured Divya, the first beneficiary of the ELTF activity, for her outstanding performance during her study period and employment with a software company. Although she was given a 10-years repayment schedule, she has almost completely repaid her education loan to Canara Bank within 3 years. The Hon’ble Minister congratulated her. PreSense also announced an Award Scheme for Bank Officials and Students for excellence in implementation and utilisation of the Education Loan Scheme respectively. The Awards will be presented during the Sansad Ratna Awards function scheduled for 27th May 2017 at IIT Madras in the presence of Parliamentarians and eminent persons. Win TV, one of the leading Tamil channels telecast the event live. Clarion Hotel President, Chennai was the ‘Hospitality Partner’. On behalf of ELTF, 13 suggestions were submitted to the Hon’ble Minister. 1. The Government should ensure 100% reimbursement of the Interest Subsidy. The amount not paid by the Government should not be loaded onto the Loan Account of the student. 2. Separate norms can be fixed for Education Loans for classification as NPA. 3. Since the Government of India reimburses Interest Subsidy, CAG Auditing of the Interest Subsidy Management should be carried out periodically at individual bank level. 4. A new Institution in the lines of NABARD and SIDBI should be set up to provide refinance for all Education Loans. 5. The rate of interest should be reduced to a minimum level. 6. A high level committee of all stakeholders should be set up to examine the present Education Loan Scheme and Interest Subsidy Management. 7. IBA and Banks should take interest in creating awareness about the Scheme among the students and the bank branch officials. Banks should hold periodical meetings with student borrowers to develop a good relationship. 8. There should be a Nodal Officer to redress the grievances at the Regional Offices and Head Offices of all banks, RBI and the Ministry of Finance. 9. Banks should stop handing over defaulted loans to Private Agencies, who harass the students for repayment. The banks should not traumatise the defaulting students by displaying their photos in public places. Instead they should adopt legal methods for recovery. 10. A possible nexus between Banks and Asset Recovery Companies (ARC) could be investigated from the vigilance angle. 11. From the data submitted by the Finance Ministry to the Lok Sabha in Feb 2017, there is no uniformity among the banks in the disbursements of Education Loans. Some Public Sector Banks and Private Banks barely participate in this Scheme. Some states do not get an adequate share of the education loan. The imbalance may be examined. 12. A ‘National Student Registry’ may be set up for all students, linking their Aadhar Cards. Banks may be allowed to access the Registry using the Aadhar Card identity of the student, to get updates about the student. 13. The rulings given by High Courts and Supreme Courts should be scrupulously followed by all banks in the respective states or the country. Presently, students are forced to approach the Hon’ble Courts for the same issue on which rulings have already been given. At the national level, the share of outstanding Education Loan over Gross Bank Credit is reducing every year. Only around 2.6 million students are the beneficiaries as on date. ELTF feels that this is not sufficient for a country of our size, keeping in mind the growth and development of our nation. Some of the States do not seem to have adequate disbursements, while some other states have received more of the share of Education Loan disbursements.